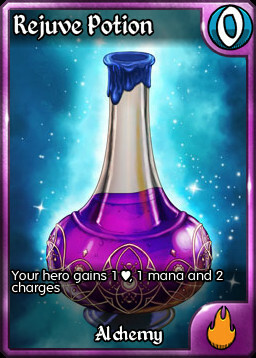 The release is complete and the new cards are available now! 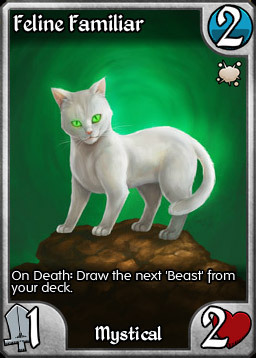 They are now available as both a pack of 13 fixed cards, or as singles in the market. You can see all 13 cards in their released glory below. 1. 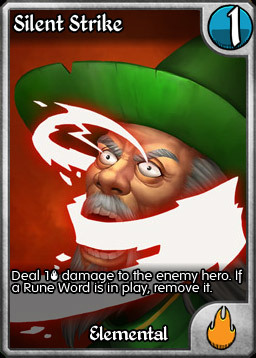 Summoner's Gambit and Wealthy Benefactor have been rewritten so that they will always be up to date with the latest release, and have no chance to grant you unreleased cards. 2. Arena Seasons will no longer award promo cards for the time being. We haven't been able to keep up with the 25 day cycles. To compensate, the Standard Arena will now award additional Gems. 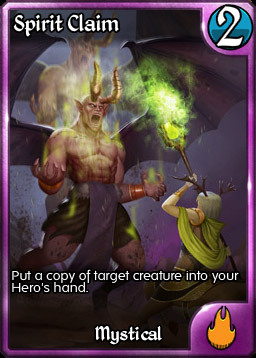 We're going to be running a contest soon to design a NEW Legendary creature. This will be your chance to get in on the design process and influence the future of the game! We will be running the contest on our official Facebook page, so if you're not following us yet, go there now and hit "Like". Here are the new cards (click to see them full sized)! For the title of "Best Two-Mana Creature" there is definitely a lot of competition. 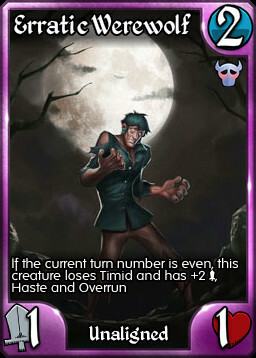 Top choices include amazing cards like Erratic Werewolf, Shrieker, Firesworn Elf and Raging Vines. In Season One: Pack One we are introducing a new creature that could very well take the top spot. A creature that can get even larger than Raging Vines without worrying about your discard pile. Feral Rager is a simple 2/1 for 2 until you read his powerful text. Every time a creature dies - whether yours or your opponent's - Feral Rager's anger grows along with his stats. 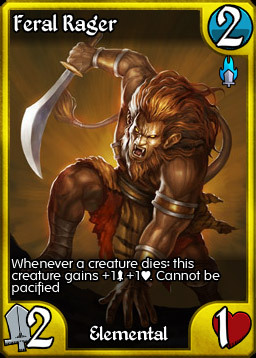 Drop him in an empty slot when you have a creature lined up to trade into an opposing creature and at the end of combat he'll be a 4/3. Attack into a smaller creature? It dies, Rager grows. And this rage is red hot and uncontrollable. The Feral Rager has Invoked which lets his sword burn through Armor and shields, and he can't be Pacified. RAGE! No pump spells. No tricks. Just kill, kill, kill and let the Ragers reap the benefits! Season One; Pack One has been submitted to Apple! While we are waiting for their go ahead, watch our official Facebook page for additional previews. If all goes well we will be live next week! 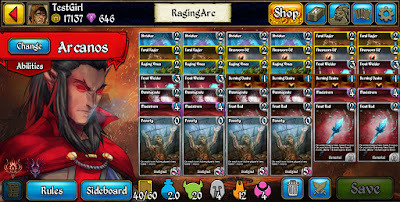 When it comes to Kingdoms CCG, your Hit Points mean everything. It doesn't matter what cards you have in hand, or how well you're positioned, if your opponent can deal those last few points of damage to you, the game is over and you're done. 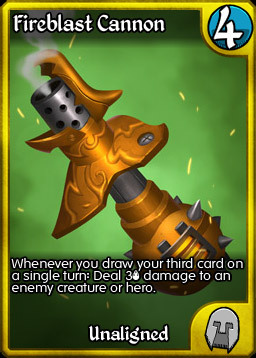 So the idea of a card that says "Your hero does not take damage" is pretty exciting. No Lightning Blast to the face. No Immolate worries. No Scavenging Goblins taking your charges. No damage. Period. If you haven't considered the Holy kingdom in the past, Guardian Angel is definitely a creature that could pull you there in the future. While the Angel herself isn't invulnerable, you will definitely feel that way while she is around. At 2/5 for 5, the Angel is definitely a good bargain. Flight help her get in for damage, while Puresoul keeps your opponent honest. Kill her or don't - no fancy stuff allowed. Of course while the Guardian Angel is putting her life on the line for you, she expects something in return. While on the board, your Hero can not gain life either. Any life you would gain, heals the Angel. 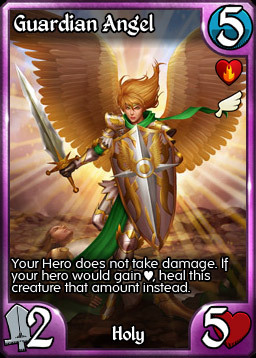 The Angel will be particularly interesting in Belnir, who can grant her Indestructible, Armor and Regen. With enough time and the right buffs, she could truly become invincible. Here are Guardian Angels copies 5 through 8. Spirit Claim is another simple, yet powerful card. 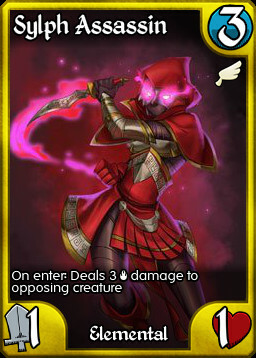 Target any creature - yours or your opponent's - and put a copy of that creature's card into your hand. You can then play it at any time just as you would any other card. The possibilities with this card are endless. Think of it as Ravinova's Prototype for creatures with no limitations. One of the best lines of play we've seen with Spirit Claim is in response to Kral, Harbinger of a New Age. You let them get their next Legendary and play it. You then play Spirit Claim on Kral, and drop him immediately, banishing both Legendaries and setting yourself up to start drawing your own. Beyond this, almost any creature with a strong On Enter ability or static ability makes a particularly good target for Spirit Claim. What decks will these cards see the most play in? That's up to you. 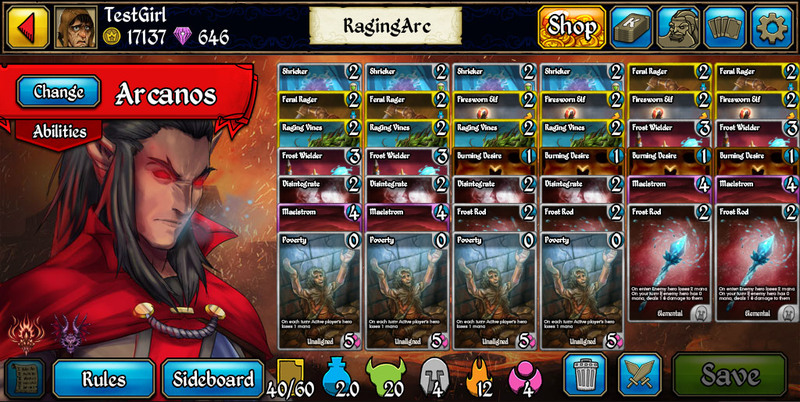 Start brewing and let us know your favorite new deck ideas. Following the cue of their Alchemy allies, the Undead Kingdom brings two very exciting new cards to the battlefield in Season One: Pack One. That's two cards, two mana, no drawbacks. 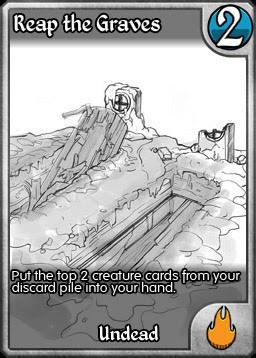 Sure those creatures have to get into your discard pile in the first place, but the over the course of a game, that's going to happen quite often. 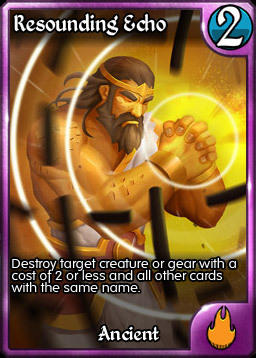 Ichor takes the card to a different level, with his heavy self-mill strategy feeding Reap the Graves with targets in the early game. In testing this card have proven surprisingly effective. 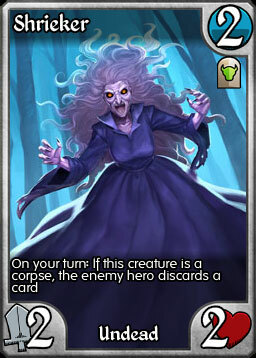 Recurring sweet Reanimate creatures like this little lady can be very frustrating, as suddenly your opponent has way more copies than you have Disintegrates. 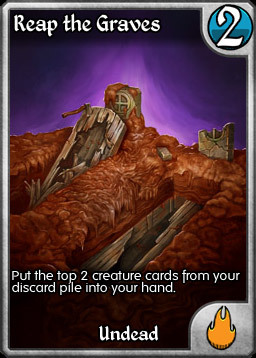 With Corpsecraft on one kicking the other to the discard pile, you can create a fast and effective chain of cards that are difficult to deal with and a wrecking ball for your hand. The second card for the Undead brings a new weapon in the war on life-gain to the table, following in the footsteps of Undead Doomsayer and The Rack, but with the potential for some truly new deck designs. The first part of his ability we've seen before. Players cannot gain life. Simple, effective. It is the second part of the ability that is new and unique. 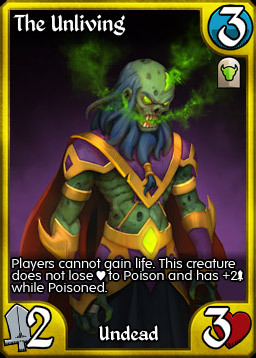 The Unliving does not lose health to Poison. None. Even with Poison 1,000 he's just fine. 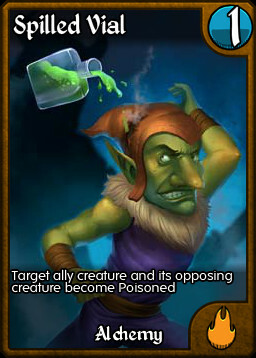 And better yet, while Poisoned, he's a 4/3. The most obvious combo is to pair The Unliving with Spilled Vial, which was conveniently moved to the Core set (Poison Bomb works as well). 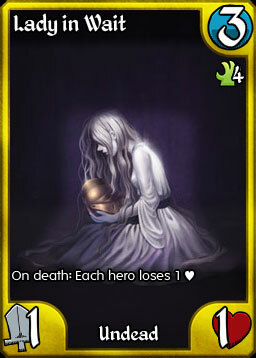 The Unliving also works particularly well against Ravinova and her Blessed Chalices. 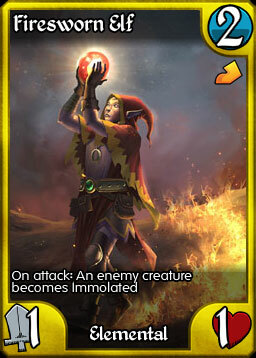 Ravinova relies on her second ability to act as permanent removal for problematic creatures. She'll have no such luck here, as her poison will only enrage the Unliving and lead to a quicker death. Welcome to the first card preview from our first Season One pack. Over the next two weeks we will be revealing all of the cards from this new pack so stay tuned! 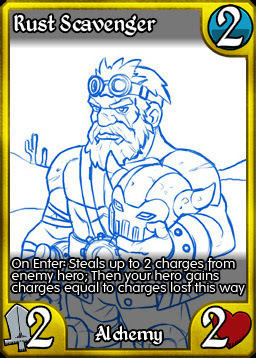 Today we're going to take a look at the cards of those crazy dwarf tinkerers of the Alchemy kingdom. 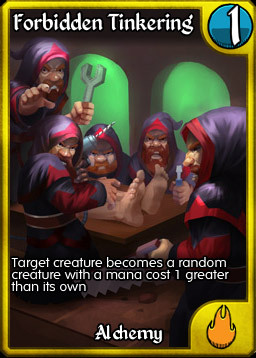 Since the upheaval caused by R'Grom's arrival, the dwarfs, fearing that this new age of magic will render their machines obsolete, have looked to their Dark Alliance brothers for a new direction. Some dwarfs have followed the cat people into the desserts of Euna, seeking to plunder the wastelands. While others chase power through the bridging of engineering and the Undead's dark arts. Yep. This scrappy dwarf is Siphon-on-a-Bear, and is useful in all points in a game: holding off powerful ultimates while charging yours, acting as a quick blocker, or as a tinker target. Ravinova can copy him all day long for added advantage. Rust Scavenger is a simple design, but finally brings the great effect of Siphon to competitive play. 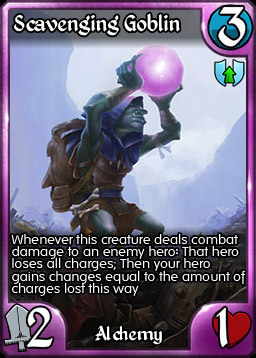 At first this card might seem like an inexpensive, yet limited version of Dravkas' Tinker ability, but in reality it works very differently. First, the creature targeted becomes a random creature with a mana cost 1 greater. Not "from your deck" but randomly from all options in the game, including those not in the format or in the opposing Kingdom! Get really lucky and your 2 drop could become that Goblin Scavenger you miss so dearly (though it could just as likely become a Stench Ghoul). This gives the card the chance to really change the board when least expected. Obviously no one like paying 3 mana for a 1/1, but the Assassin's effect is extremely powerful. With Forbidden Tinkering you can play the Assassin, kill the opposing creature, then if not removed, on your next turn play the spell and attack with the new found 4 drop. Get lucky and you're now attacking with a Dwarven Battle Rig or Libracider. 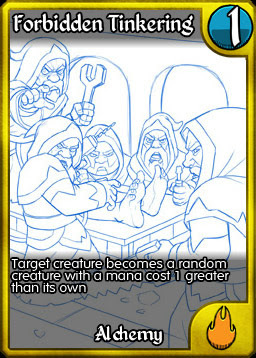 Finally, note that it doesn't say "target ally creature." That's right, you can tinker your opponent's creatures as well. Why would you do this? Say your opponent has just played Elara and you don't have the direct damage to kill her. Forbidden Tinker to the rescue! 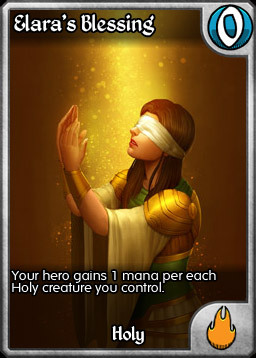 You has a 1 in 3 chance that Elara will become a Realm Crusher that missed its On Enter - an expensive 2/2, easily removed. Forbidden Tinkering is a powerful card that brings both chaos and excitement to the table, and has the potential to become an Alchemy staple. This Standard-legal deck packs a ton of utility creatures that can be run up Dravkas' own Tinker chain, or transformed with Forbidden Tinkering. Summoner's Gambit adds to the chaos, but really works here as hitting a four or five drop on turn 1, then using Forbidden Tinkering on Turn 2 to ramp up even more is quite the deal for 4 mana across two turns. I used this deck to record some test battles against the A.I., including a battle against an Epic tier Legacy Guild Wars defence deck. Here are some highlights. Enjoy! 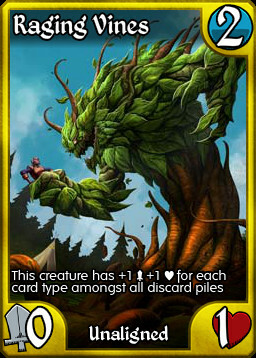 As mentioned back in June, our next set will be a 13 card fixed-pack set, with 3 Epics, 6 Rares and 4 Uncommons. 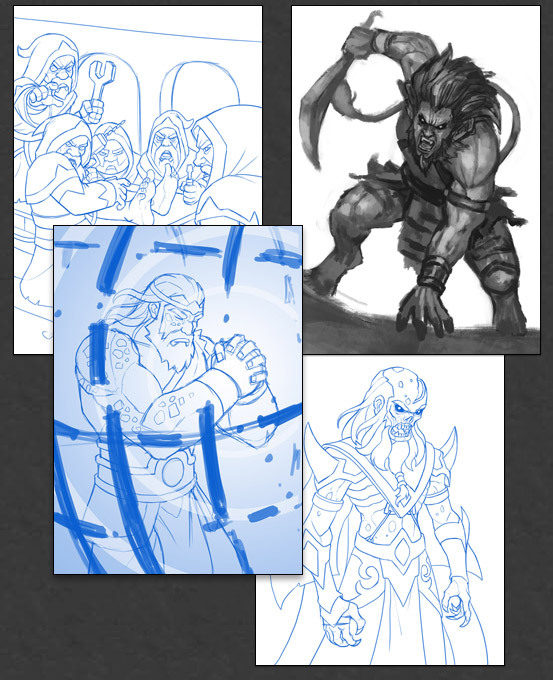 The cards are now being painted, but as we're received and approved the early sketches, we thought you might like to get an early look at the art you'll be seeing across the table. A main deck playable anti-life gain card that you might even build around. 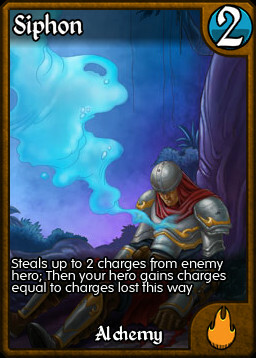 A card with the text "Your hero does not take damage." Today we've fixed a number of bugs, many of which were a result of the switch to the 8 gear cap. 1) Creatures like Raging Vines and Rotfeeder now receive their ability modifiers before "On Enter" effects occur. Now playing a Rotfeeder into a Shard Caltrops or Vial of Fire while there are 10 creatures in your graveyard will result in a damaged 5/5, not a dead Rotfeeder. 2) Steelbane Overwatch will no longer take damage from Shard Caltrops. 3) If you use Dravkas' Manufacture on a gear while you have 8 gear, nothing will happen (this will still use the charges). 1) The Advanced Tutorials now properly award 10 card, new Core packs. 2) Legacy Constructed tournaments are now properly labelled. 3) Acquiring Wilirus now awards Hexlifter Cleric instead of Thoughtful Cleric. The change from Thoughtful to Hexlifter in Core happened late in development and we missed this when the change was made. 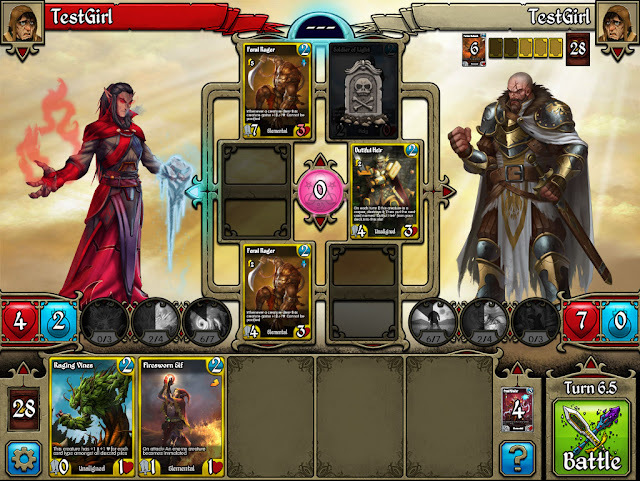 For the next few months we are going to focusing on marketing Kingdoms CCG to try to increase the user base. With the new Core making getting into the game much easier, it's time to get the word out that now is the best time to be playing the game. We will be doing this with more advertising, more promotions and more "official" game play videos to get the word out. You can help as well. Continue making your own Kingdoms game play videos and support your fellow players by checking out those videos on YouTube. If you've got a video that you're particularly proud of, drop us a note at kingdomsccgsupport@ganz.com and if we like the video, we'll feature it on our Facebook page. How will be making these game play videos? Over the next couple of weeks, watch for GANZ_Karl to appear online. He'll announce which tournament he'll be joining and then jump in with him! Those tournaments will be recorded and highlights posted to YouTube and Facebook. The best part? Everyone who plays a match against Karl, win or lose, will receive 10 Gems per match (quick conceding, byes, match ups after you've left obviously won't count). Karl will be playing to win so bring your A game! While we will be focusing on marketing, we still want to give you new toys to play with. On this point we've gone back and forth as to our best next step. The question came down to a debate over which model is better: randomized booster packs or fixed sets. This question is something that physical games have been wrestling with as well. While a few games, like Magic, Yu-Gi-Oh and Pokemon have stuck to the randomized model, many newer games including Game of Thrones LCG, Netrunner, and the reboots of Doomtown and VS. System have gone with fixed packs. In the end we've decided to move to fixed set model for now. Our plan currently is to release our next 3 sets this way, combined to make a single "Season One" expansion. 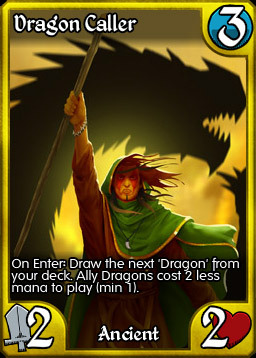 Each set will feature 13 cards, 2 for each Kingdoms plus 1 Unaligned. The rarities will be 4 Uncommon, 6 Rare and 3 Epics. Now we learned a ton from the Meta Pack. Feedback was pretty resounding that the cards in the Meta Pack were too narrow to make a big difference to the game. In other words, while they were solutions to specific problems, players didn't want to be solving those problems. What players like to do is cause problems for their opponents, and the Meta Pack cards didn't do that. We also understand that not all players will want to pay for our fixed sets. 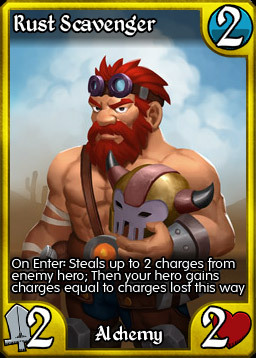 We do want all of our players to be able to get these new cards, so we'll be addressing these needs as well. 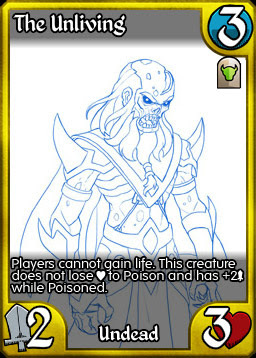 1) The cards in these new sets will be much more "active". Many will be cards that you can build around to win games in grand fashion. There will still be utility cards, but these will be of universal value. 2) All of the cards in new sets will be available as Gem singles the day that they are released. We're making sure that buying the full set is an amazing value, but for playing that like to pick and choose, we won't be standing in your way. We will posting more information on the first of these sets in the weeks to come. Enjoy, and we'll see you on the battlefield!